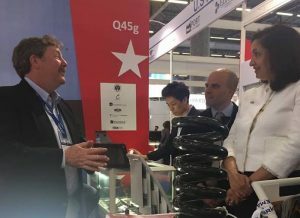 Several Composites Alliance members have recently returned from France, where they exhibited at the JEC World International Composites Event. The largest composites trade show in the world that covers the whole composites value chain, the event was held in Paris in mid-March. This was the first time that the Composites Alliance has organized a Rhode Island presence, and companies that joined the Alliance in the booth included Tri-Mack Plastics Manufacturing Corporation, New E ngland Boatworks, and Clear Carbon & Components. Another member of the Alliance, Concordia Fibers, had their own booth in the US Pavilion. The marketing effort of creating a state presence was coordinated by Katherine Therieau, director of International Trade Programs for the Rhode Island Commerce Corporation, in partnership with the Chafee Center for International Business at Bryant University and the U.S Commercial Service in Providence and Paris. STEP (State Trade Expansion Program) funding was used to offset the cost of the booth. Making the most of a valuable opportunity. Attendees from Rhode Island companies felt the JEC World event created good exposure for their products and expertise, and individuals such as Matt Dunham of Clear Carbon & Components found the show allowed him to make connections he would not otherwise have made. For Don Watson of NEB, the show was a valuable opportunity to learn about new materials and techniques and to make the kind of connections that may help NEB advance its manufacturing process. For several attendees, the most critical value of the show was the opportunity to meet and connect with clients, potential clients and suppliers from around the world. “It was an excellent opportunity to talk with decision-makers,” said Tom Kneath of Tri-Mack Plastics. Kneath and Randal Spencer of Concordia, who has done this show for four years, advised future attendees to do the advance work of pre-booking meetings before heading over to the show. With such a vast territory to cover in only a few days, everyone’s time is at a premium. Kneath was accompanied at the show by Joch McCaughey, and he felt a two-person team worked well: while Kneath was largely in meetings, McCaughey was available to talk to individuals coming by the booth. Spencer also had some key advice for approaching each meeting. The JEC World event is not one where companies are trying to dazzle potential customers: “You are there to help people get their problems solved,” said Spencer. All attendees praised the ease of participating in a group booth, where logistics were managed well to make for a smooth event. Student translators from a local technical school were part of the package, and these individuals were valuable partners in dealing with language issues. STEP Funding helped to defray costs. STEP (State Trade Expansion Program) funding, administered through U.S. Small Business Administration’s Office of International Trade, was used to offset the cost of the Rhode Island booth. STEP Funding can also be used by companies that are doing an international show like the JEC event on their own. The STEP program is designed to assist small businesses with export development, and the mission of the program is to both increase the number of US small-business exporters and the volume of their export sales. In addition to supporting a company’s participation in a foreign mission or trade show like the JEC event, the financial support from STEP funds have helped US small businesses learn how to export, obtain services to support foreign market entry, develop websites to attract foreign buyers, and design international marketing products or campaigns. Small Rhode Island businesses interested in the STEP program should contact Linda Woulfe at the Chafee Center for International Business (401-232-6525). Attending the 2018 JEC World. The 2018 JEC World International Composites Event will be held again next March (March 6-8) in Paris. The Composites Alliance will again work with the RI Commerce Corporation and its partners to explore having a booth at next year’s event. Several Alliance members are already interested in returning, and space is limited. Contact Wendy Mackie (email / 401-396-9619) if you are interested in participating next year.